APE is a free program that helps you to calculate M and Q values for players in poker tournaments. APE calculates the M and Q of all the players at your table in a poker tournament. APE does not automatically scrape the chip stacks from the table as you play -- you have to enter the stack sizes manually. Therefore, APE is best suited to post-tournament analysis. Use it when you want a quick and easy display of the M and Q of each player at the table at a specific point in a tournament. 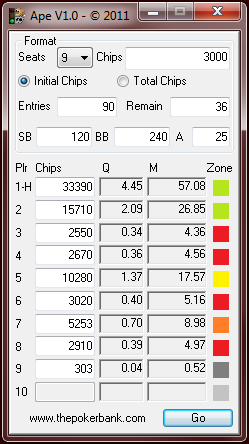 Note: APE can be used to calculate M and Q in both MTT and SNG tournaments. Select the numbers of players at your table. Enter either the initial number of chips each player started with (this is the easiest), or the total number of chips in use in the tournament. Enter the total number of tournament entrants and the number of players left in the tournament (this will be the same as the number of seats/player if you're at the final table of an MTT or playing in an STT). Enter the current size of the big blind, small blind and ante (leave it blank or put "0" if there is no ante). Enter the stack sizes for each player at the table. Click "Go" and let APE do it's magic. Why use the APE M and Q tournament calculator? Knowing the M and Q for you and your opponents is useful for helping to decide how you should play your hand in the middle of a poker tournament. However, when you're reviewing and analysing hands you have played from a previous tournament, it's not much fun fiddling around with a calculator to work out the M and Q numbers for each player at the table. Furthermore, it's even trickier to round up all those M and Q numbers and have them at hand for quick reference. APE takes the hassle out of M and Q calculations by working them out for each player for you. It also displays the M zone colours as outlined in the famous tournament poker book -- Harrington on Hold'em. APE works from the basic formulas used for working out M and Q in poker tournaments. The maths is simple. APE just makes it easier to work out and display M and Q numbers for multiple tournament players at a time. Works for both MTTs and SNGs. Displays corresponding M zone colours for each player. Why is it called "APE"? Yeah… pretty rough. It does fit in nicely with the simian theme for tournament tools though (see CHIMP), so we'll stick with it. If the APE M and Q tournament calculator makes your tournament poker life easier, make Iain's life more fun by donating towards his beer fund. $2 should cover a shandy, and $3.50 should just about cover a pint. Anything you can send Iain's way though is hugely appreciated.